1. 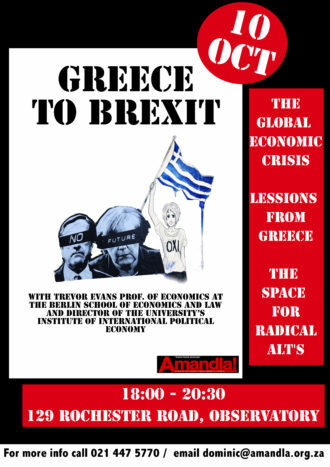 Monday, 10 October: Amandla hosts Prof. Trevor Evans who will speak on the Global Economic Crisis; the Lessons from Greece and the Space for Radical Alternatives. 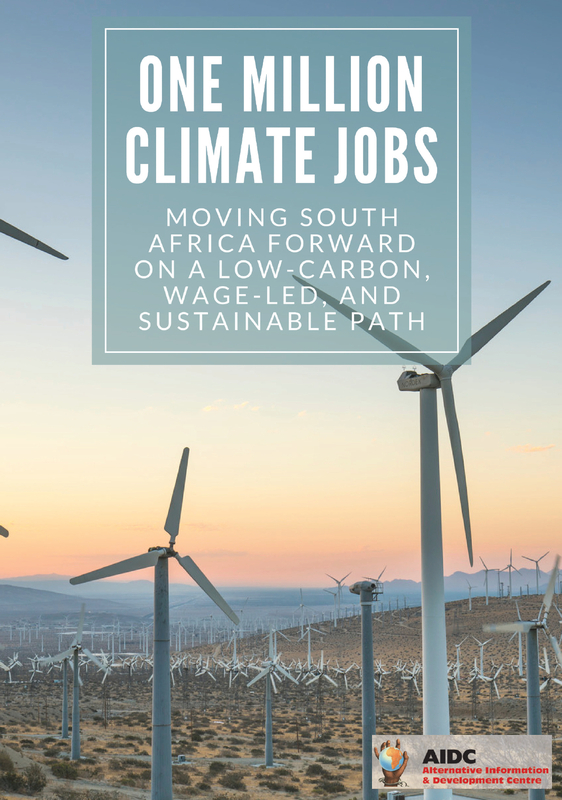 Evans will look at why it is that when progressive parties move into government – like Syriza for example, they are unable to fulfill their mandates and implement a different, more “people-centered” development path. It would be too simple say that they are simply sell-outs. Join us as we discuss the space for radical alternatives in the current political context. Trevor Evans worked at the Central American Institute for Economic and Social Research in Managua during and after the period of the revolutionary government in Nicaragua. Until 2015 he was professor of economics at the Berlin School of Economics and Law and Director of the university’s Institute of International Political Economy. He has published widely on Marxian and Post Keynesian theories of money and crisis, and on the political economy of the United States, the European Union and Central America. 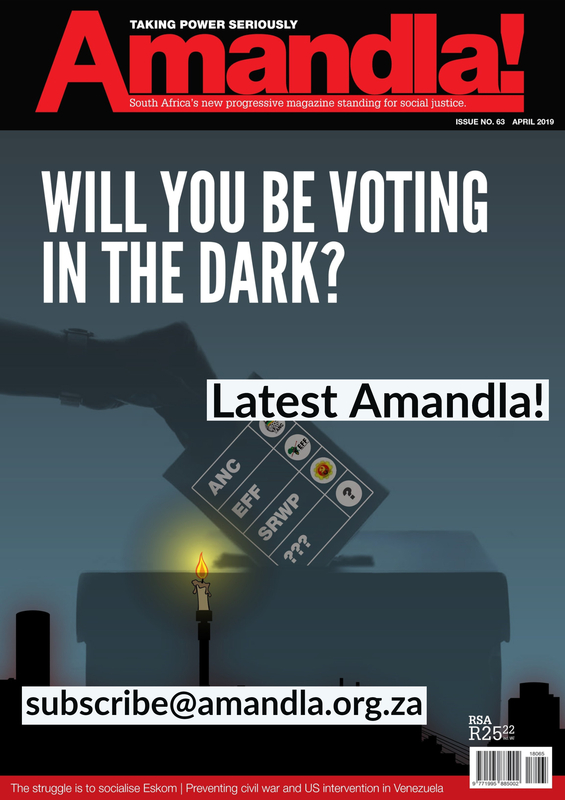 gangsterism in Cape Town. 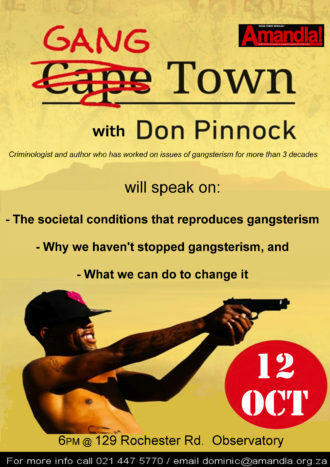 We are fortunate enough to host Don Pinnock a criminologist and author, who has done more than 30 years of research on the issues of gangsterism. Pinnock will speak on the societal conditions that reproduce gangsterism; why we have not been able to stop gangsterism and what we can do to change it. Don Pinnock an investigative journalist, criminologist, environmental activist and photographer. He has written 17 books covering history, politics, the environment, gangs and science.